Home / Blog / Uncategorized / Workplace Culture: Is there a Harvey Weinstein lurking in your organisation? Workplace Culture: Is there a Harvey Weinstein lurking in your organisation? The speed with which countless Hollywood stars, directors and movie moguls have come out in little over a week to say they knew what was going on is beyond belief! They all knew, they said, but chose to keep quiet for a variety of reasons. It’s now inevitable that other names will appear as perpetrators of similar habitual harassment and abuse of women. Already, a hashtag #metoo has emerged for people who want to say ‘enough is enough’. But is it enough? Outside of Hollywood, there have been many instances of such intolerable behaviour over the last few years, including here in Australia. Weinstein’s defence of “that was then, this is now” is pathetic. Many people knew, could have known, should have known; should have said something. But the prevailing culture in many organisations is to ‘go along to get along’. A wide variety of rationalisations are used to justify silence: ”somebody else will surely say something”; “it’s not my role to handle HR issues”; “He’s a powerful man. How can I stand up to him?”; “They’re all the same; there’s too many of them”; and, “it’s been going on for so long and many people know about it, how’s it going to look if I speak up now?” We always have to focus on the impact such behaviour is having on the person at the centre of it, so it doesn’t matter when atten-tion is called to it. At least it stops. Organisations have Codes of Conduct that expressly call out this sort of behaviour. Why do they not work; why do they not protect employees from this sort of gross behaviour? Because, regrettably, as we see in the Weinstein case, it starts in the executive suite where there is often a ‘cone of silence’ when it comes to uncon-scionable conduct. If leaders don’t hold each other accountable for poor behaviour, that tells people the sorts of behaviour they can get away with. Failure at the top then signals to managers below, that they too can get away with bad behaviour. It’s the cause of many dysfunctional business cultures. It costs on the bottom line, and gives rise to low productivity, low innovation and lack of employee engagement Gallup. At its most fundamental, people don’t speak up because they don’t have the language – or skills and practice, or courage – to call out this sort of behaviour. 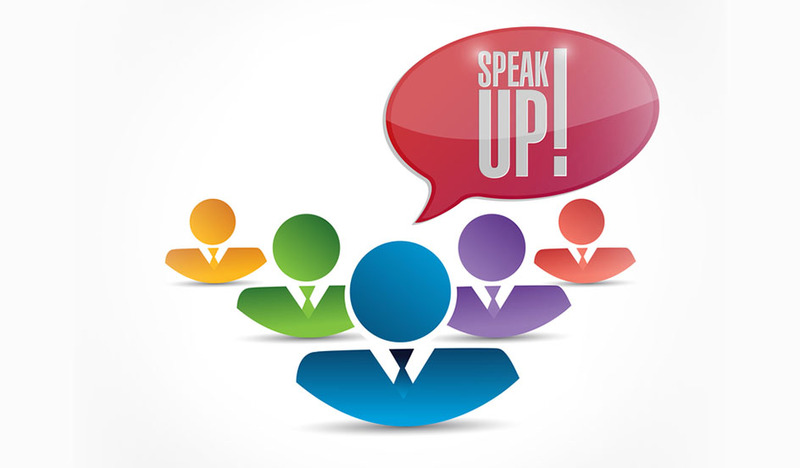 “Speak up” cultures have become the latest corporate desirable in the wake of regulator demands and stron-ger whistleblowing protection. However, little has been done so far to pave the way for such cultures to emerge. Speak-up aspirations are more akin to a corporate wish list. Let’s put it out there and somehow, magi-cally; it will happen. If only human behaviour were that simple. Speak for self and focus on behaviours. People will often dismiss inappropriate behaviour as a ‘one-off’ (having a bad day, etc.) but if you can point to several incidences they’ll know that it’s a pattern that’s been observed. At its simplest, it means surfacing and building on the human dimension of business, the human relationships which are at the core of all business activity. It demands a new type of authenticity from leaders, one that seeks to eliminate the gap between what they say they value and how they go about living those values daily, including meeting the challenge of holding peers to account for their poor role modelling. It means looking inwards to identify how we have excused poor behaviour in the past and then rehearsing how to act better in those challenging situations that will inevitably come to light again. In reality, most of the time, most of us do know what the right thing to do is. It’s not that its grey, it’s more that we don’t know a safe way of taking action and acting on our values. Instead of moralising, Mary Gentle’s techniques move the enquirer from simply reflecting on the issue to a focus on problem-solving and action. If we truly wish to promote healthy workplace cultures, then leaders need to build the behavioural infrastruc-ture that enables healthy workplace relationships to emerge. A Code of Conduct is not enough to guide and maintain workplace behaviour standards. For too many, it’s become a case of “set and forget.” To be a living document the Code’s intent has to be supported by workplace learning opportunities that enable positive human relationships to flourish. E-learning won’t do it. It’s not a cognitive task; when people know the right thing to do, they also need to know “how” they can do so safely, and that is an outstanding challenge for employees at every level in organi-sations today. It’s only by truly valuing your corporate values and supporting the sort of relationships they can enable or disable in the workplace, that will prevent a version of a Weinstein-style time bomb ticking away in your organisation. Do we need another hashtag viral campaign to make AI safe for females? RISKY BUSINESS – or business ethics by another name? Stepping up to ethical leadership vs. more of the same? Ethical Blindness – one eye open, one eye shut? Is thinking ethically different to thinking compliance? What Price Austerity – Whose Ethical Interests do Governments Serve? Ireland: Water, Water, everywhere – as long as you’re prepared to pay! Business Ethics in Dublin, Ireland – Is unpaid work ethical? How legitimate is your Code of Conduct? Is it because people are not valued that leaders do not measure workplace culture? Is collective unethical behaviour shaped by poor management practices? Ethical Leadership: Is Tone at the Top measurable? Why ethical behaviour differs amongst employees? Business Ethics Pays on the Bottom Line!